Many of my customers who love the sound of their new guitars will buy the same pickups for another guitar and wonder why it doesn’t sound the same. I tell them pickup height adjustment is a big part of getting the sound you want. For every guitar that I build, I spend a lot of time adjusting pickups. Here’s the simple method that I use. 1. Tune your guitar and sit holding it as if you are playing it. Starting with the bridge pickup, hold the high E string down at the last fret and set the distance from the top of the high E pole piece to the bottom of the string – about 3/64. Going to the low E string, do the same thing, but set the gap around 4/64. 2. Plug in the guitar and play just the bridge pickup through an amplifier that you are used to hearing. If it needs more treble, bring the treble side closer to the string. For less treble, move it farther away from the string. Do the same thing on the bass side until you have the sound you want. Take your time. Listen closely and trust your ears. 3. Now go to the neck pickup. Again, holding the high E string down at the last fret, bring the treble side as high as it will go without touching the string. With the guitar plugged in, hit the high E string. Go back and forth between the neck and bridge pickup to see how they balance. Pluck the low E string and bring the bass side of the neck pickup up until it is about equal to the bridge pickup. I personally like the bridge pickup a bit louder. Play the guitar in all three pickup positions and listen closely. Here is where you can make slight adjustments to balance the sound to your liking. I personally like a bright, clear neck pickup sound without the bottom end being too muddy and an even-sounding, clear bridge pickup. This will give you a good starting point, and from there the final adjustments come from listening and trusting what you hear. When my ears start to get fatigued, I find it helpful to walk away and do something else until I can come back to it with fresh ears. The more you make these adjustments, the quicker you will become. 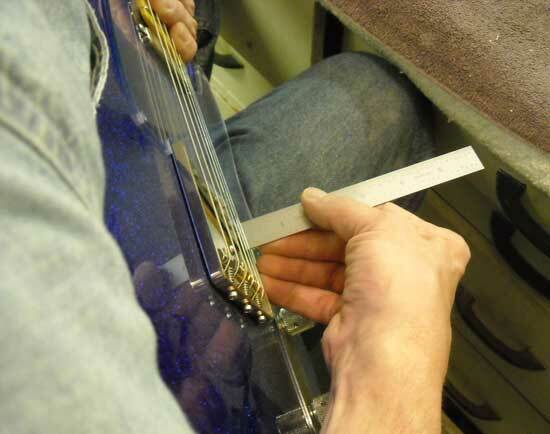 Pickups are mounted with screws to allow you to move them back and forth, so you are not going to hurt your guitar. The worst that can happen is you will have to start over. Don’t be afraid to experiment, and have some fun with it! This entry was posted in Tips and tagged neck, pickups, strings. Bookmark the permalink.